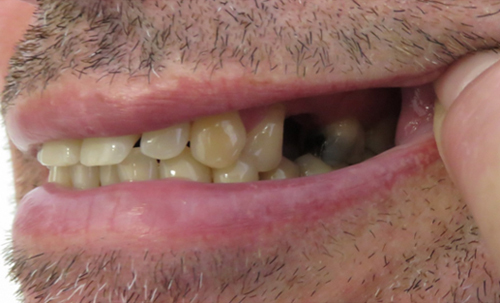 This patient had a gap in his smile after losing one of his upper teeth. His dentist Justin Scrivens explained the options – leave the gap or replace the tooth with a partial denture, bridge or dental implant. The patient chose to have a dental implant and is delighted with the result. 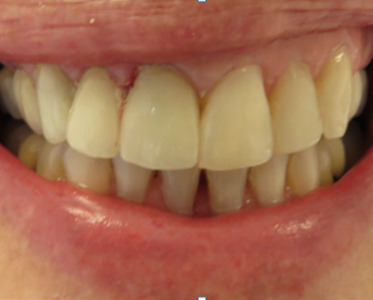 This patient recently joined the practice and was unhappy with her smile in particular the grey lines above her old crowns, the dark patches next to the gum on several lower and upper front teeth and the position of her UL2 incisor. 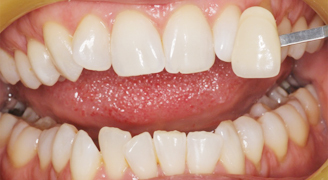 The treatment plan agreed was to replace three crowns at the front of the mouth with Emax ceramic crowns to match the gum line and cover the dark areas . Composite bonding (tooth coloured material) has covered the dark patches at the gum line of the other teeth and a direct composite veneer has been used to bring the UL2 canine tooth in line with the other upper teeth. The patient is now very happy with her smile. 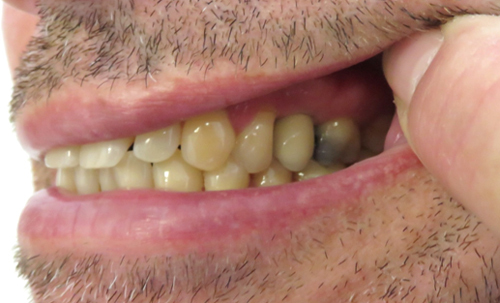 This 25 year old patient came to us with three existing amalgam fillings which he felt were unsightly. On examination we found that one of these fillings required replacing due to decay found under the existing filling. 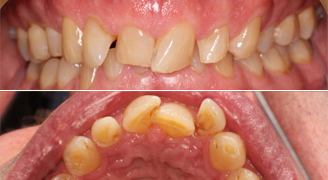 The patient made the decision to replace all three with composite (tooth coloured) fillings. 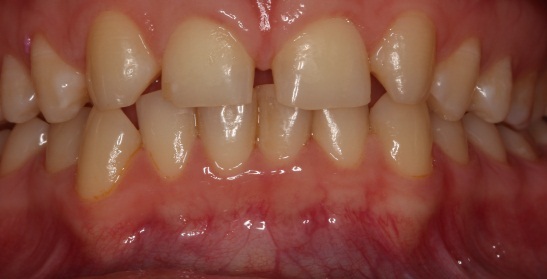 This patient was interested in a short term orthodontic solution to straighten his upper front teeth. His treatment plan included short term removable appliances, composite bonding to create uniform tooth length and teeth whitening. 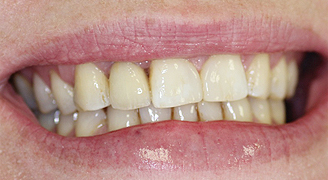 This patient was keen to have whiter teeth and discussed teeth whitening treatment with her dentist. 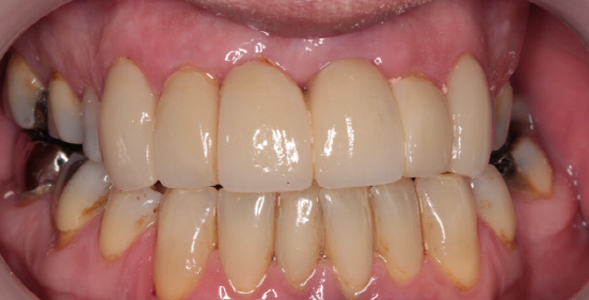 Following her treatment the patients teeth were over 7 shades whiter. She is very happy with her new smile. 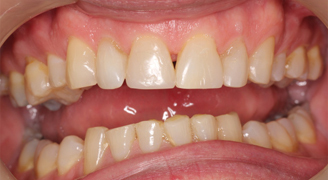 This patient was unhappy with the gap between her top two teeth and was looking for orthodontic treatment that could close the gap in a relatively short space of time. 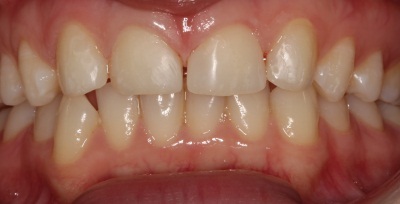 We advised a treatment plan to include the use of removable invisible braces and composite bonding on the upper two front teeth and an all ceramic crown on the dark tooth shown on the photo to the left of the top front tooth. 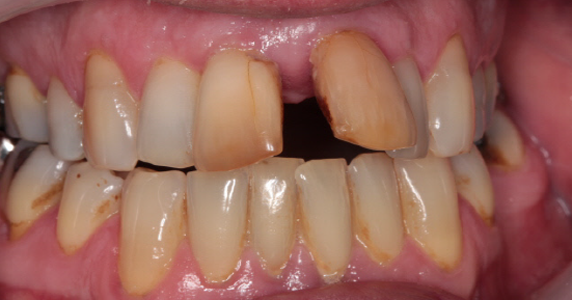 This patient presented to us two very old crowns and especially disliked the dark line visible to the gum. 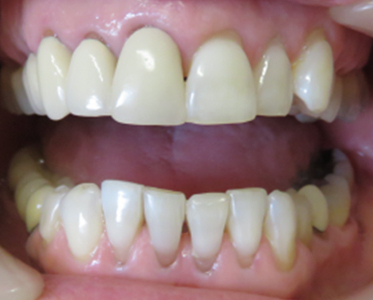 Our dentist suggested the patient undergo teeth whitening first and then have two new Emax ceramic crowns fitted to match the gum line and cover the dark areas. Our patient was delighted with the result. If you have older crowns and are unhappy with their appearance talk to us about the treatment options that are available. 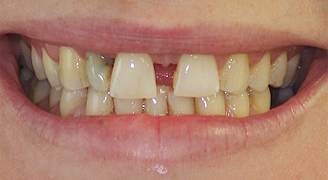 This patient was unhappy with the appearance of his top front teeth. 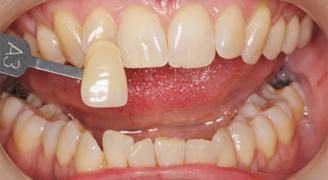 Treatment options were discussed and it was agreed that the patient would have his upper two front canine teeth removed and a bridge would be made to incorporate his four upper canines and two incisors. The patient is now very happy with his smile.